I’m on express train ICE 791 southbound from the German capital. When my nose isn’t stuck against the window, I’m stationed at the exit doors, swinging back and forth with the train, gazing out to familiar scenes in the German countryside: hills, farmlands, little towns, and rows of towering wind turbines. I’m on my way to Leipzig. From the moment I was introduced to the music of Johann Sebastian Bach, Leipzig has never strayed far from the imagination. As my train races to Leipzig, I’m looking for help with the following questions. Why is Leipzig being compared to Berlin? How do Leipzig’s historical experiences shape the city today? There are no promises for any answers, but there are plenty of places to begin. As Leipzig celebrates a milestone millennium, the city has quietly left its mark on Germany and Europe with religion, trade, books, music, and the 1989 “peaceful revolution”. Recent attention on the art scene in Leipzig has drawn comparisons with Berlin. Some disagree and bristle with labels such as “Hypezig” or “the new Berlin.” But the people of Leipzig carry on, unfazed and perhaps bemused by the attention. Fact is Leipzig can be described in at least three ways: a city of heroes, a city of trade fairs, and a city of music. Stepping off the train upon arrival, I stroll into a mammoth concourse in one of the largest train stations on the European continent. I’m completely in my element here in the station’s spacious hall, setting me in a proper frame of mind to kick off my time here in Leipzig. With origins dating to the 12th-century, St. Nicholas Church is better known today for its connection and origins to demonstrations against communist rule in 1989. Because unapproved public assembly was against the law, churches were safe places to gather, although all who entered were photographed and monitored. Weekly Monday prayers began in the early-1980s, which began developing into public assemblies. They grew and spilled out onto streets as peaceful marches and the Monday demonstrations. October 9 became a “Day of Decision” as East German authorities countered with massive police and security presence. An estimated 70 thousand people appeared and the demonstration proceeded peacefully with security forces staying back. The size, scale, and importance of these protests became apparent to everyone after video footage took a circuitous route out to the West. 120 thousand people appeared in a demonstration the following Monday, and 300 thousand were in attendance on 23 October. Demonstrations began in other cities in East Germany, and by 4 November, an estimated half million attended demonstrations in East Berlin. The Wall dividing East and West fell on 9 November. What’s remarkable is that the internal revolution remained largely peaceful, especially with people and authorities very aware of the massacre months earlier in Beijing’s Tiananmen Square. The photo above is at the Museum Runde Ecke, which housed the Leipzig District Administration of the Ministry for State Security (Bezirkverwaltung für Staatssicherheit, Stasi) from 1950 to 1989. Even with the fall of the Wall and the collapse of one-party rule, weekly Monday street demonstrations continued with people demanding open access to their security files. About 150 thousand marched on 4 December 1989 towards the local Stasi administrative offices. People crashed through the doors, pushed their way inside, and occupied the building, protecting countless Stasi files from destruction. While most think of Berlin as primary staging for the fall of the Wall, Leipzig is where peaceful demonstrations driving the push to end communist rule began. In the Middle Ages, Leipzig was at the crossroads of two major trade routes in the Holy Roman Empire: the east-west “Via Regia” (Royal Way) and the north-south “Via Imperii” (Imperial Way). Throughout the centuries, Leipzig welcomed goods, people, and traditions from throughout Europe. Leipzig was granted market rights by Otto the Rich (Magrave of Meissen) in the middle of the 12th-century, and the city was granted imperial fair privileges by Emperor Maximilian I in 1497. Riquet's family emigrated as Huguenots from France to Germany; in 1745 they established in Leipzig a company trading in tea, coffee, & spices in the Far East. Built in 1908-09 at their present location, the Riquet coffee house in Leipzig is an uncommon example of Jugendstil or Art Nouveau architecture in the city. Leipzig, Germany – 2 Dec 2014. The Riquet family emigrated as Huguenots from France to Germany and in 1745 they established in Leipzig a company trading in tea, coffee, and spices in the Far East. Built at the present location in 1909, the Riquet coffee house is a unique example of Jugendstil or Art Nouveau architecture in the city. 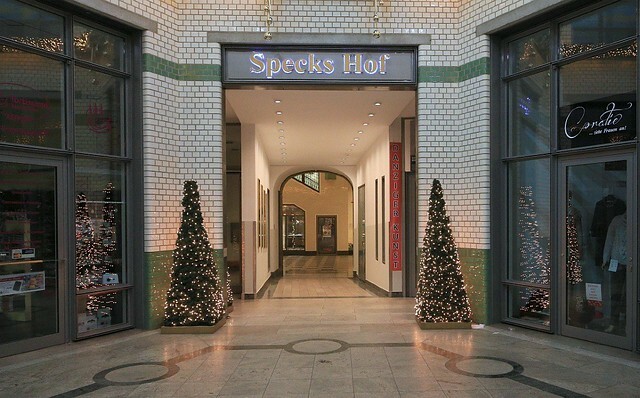 Specks Hof is an example of one of the oldest shopping complexes dating back to the middle of the 15th-century where a building with living space and brewery once stood. The merchant and art collector Maximilian Speck purchased the corner building in 1815, naming the building Specks Hof (Speck’s Courtyard). In the early 20th-century, the architect Hansel redesigned the building as an exhibition house for the Leipziger Messe trade-fair. Post-war reconstruction took place in 1947 with additional renovation in the 1980s and 1990s. Today, Specks Hof is a prize-winning example of the city’s architecture. Like many fond of classical music, one dreams of walking in the footsteps of famous composers, musicians, and artists. I’ve followed them along the Leipzig Music Trail (Leipziger Notenspur). To stand in the same places where Bach and Mendelssohn once played and led their respective choirs in song is a big thrill. From 1723 until his death in 1750, Johann Sebastian Bach was choir director of St. Thomas Church (Thomaskantor, Thomaskirche). His responsibilities included arranging music for a number of churches in the city and teaching Latin. Bach led the church’s choir, the Thomanerchor, in existence since the early 13th-century. Bach’s remains were moved in 1950 to the present resting place in the nave of St. Thomas church (shown above). This building on the south side of Leipzig's Augustusplatz is the city's Gewandhaus, home to the Gewandhausorchester. They're the world's oldest civic symphony orchestra, having been founded as a society in 1743, and playing in the Gewandhaus for the first time in 1781. As its name suggests, the original Gewandhaus was a "garment house", a trading house for textile merchants. Between 1835 and 1847 (except for one year), Felix Mendelssohn Bartholdy was Gewandhauskapellmeister, or the Music Director. Other notables including Mozart, Beethoven, Wieck, Liszt, Schubert, Schumann, Brahms, Wagner, Tchaikovsky, Strauss all performed at the Gewandhaus. The present and 3rd version of the Gewandhaus was completed and inaugurated in 1981, the only dedicated concert hall ever built in former East Germany. Visibly illuminated through the glass facade and hanging above the front entrance is the giant mural "Gesang vom Leben" (Song of Life) by Sighard Gille. The following expression has appeared in some form at the Gewandhaus since 1781, a quote attributed to the Roman philosopher Seneca: "Res severa verum gaudium" – "True pleasure is serious business". Leipzig, Germany – 2 Dec 2014. Leipzig is first mentioned in 1015 as a trading settlement, “urbs Libzi”, in the chronicles of Bishop Thietmar of Merseburg. Along with year-long celebrations in 2015 marking Leipzig’s millennium, the city will also celebrate the 850th anniversary of the Leipzig Trade Fair and the 850th anniversary of St. Nicholas Church. "Lipz" or "Lipsk" are early names for the city of Leipzig from the Sorbian (Slavic) word "Lipsk", meaning "place of linden (lime) trees." The Czech name for Leipzig is "Lipsko". 2015 marks the 1000th anniversary of the first mention of the settlement as "urbs Libzi" in the chronicles of Bishop Thietmar of Merseburg. This bottle of Lipz Schorle is a refreshing non-alocoholic fizzy drink, made & bottled in Leipzig. Baumwollspinnerei, Leipzig, Germany – 3 Dec 2014. “Lipz” or “Lipsk” are early names for the city of Leipzig from the Sorbian (Slavic) word “Lipsk”, meaning “place of linden (lime) trees.” The Czech name for Leipzig is “Lipsko”. This bottle of Lipz Schorle is a non-alcoholic fizzy drink made and bottled in Leipzig. It’s easy to be carried away by the stories. The sense of knowing civic pride mixed with quiet humility. That there’s much less historical baggage and less attention than the sharp focus on the capital city. I’ve barely scratched the surface over the short time here. I must come back to meander along the “Karli” (Karl-Liebknecht-Strasse), to explore the Musikviertel and Mediaviertel, the former Industriegebiet, and the green belt; to sit among the linden trees next to the pit-lakes; to absorb the day-to-day in the “Lipsk”. I leave Leipzig recognizing her people aren’t very concerned by the “Hypezig” label or declarations as “the new Berlin”. Leipzig is a place whose people have always recognized change, always been a city about publishing, of coal, of food and drink, where trade and commerce intermingle freely with open culture. Hourly trains with Deutsche Bahn’s InterCity Express service go between Berlin and Leipzig in 70 to 80 minutes. Frequent rail service from Dresden to Leipzig take anywhere from 70 minutes (IC, ICE trains) to 100 minutes (RE trains). I made seven images above during my 2-4 December 2014 visit, graciously hosted by Leipzig Tourismus und Marketing GmbH (LTM). Thanks to Christine Horchheimer, Michael Luderwig, and Simone Feldmeier for their tours, and to Jane Langforth and Steffi Gretschel at LTM for their help. This post appears on Fotoeins Fotopress at fotoeins.com as http://wp.me/p1BIdT-6fC. Hi, Timo, and I agree. One of many things I learned in Leipzig was how Saxony has been “reduced” over time because they were on the losing side. 2 days weren’t enough, and I want to spend more time in Leipzig. I’m also looking at cities like Erfurt, Weimar, Dessau, Lutherstadt Wittenberg, as well as a bunch of places on the Nordsee and Ostsee coastlines. Hi, Timo. I forgot Quedlinburg is a UNESCO site. I just checked out a couple of videos online: ach wie schööönnn. Thanks for the reminder! I like the shot of the Gewandhaus, looks quite impressive. I only passed through Leipzig once, and only for a couple nights, back in summer of 2003. At that time, I recall there being LOTS or renovation happening. I too am fascinated by the coasts, Baltic particularly. Hi, Bob, and thanks. It’s a tight-crop, tighter than I wanted, because I visited during Xmas market, and the Xmas market stands were in the way, and I couldn’t go “further” back for a wider shot. Any further back, and the stands would’ve been smack dab in the way. So, I chose to focus on the shot I put up on the geometry, the glass, and that mural within. I’d love to spend a few days in the Leipzig area when it’s green and summery. And oh hey, gotta give the respect to all that good and beautiful stuff happening along the North- and Baltic Sea coastlines! Thanks again for reading and for your comment!